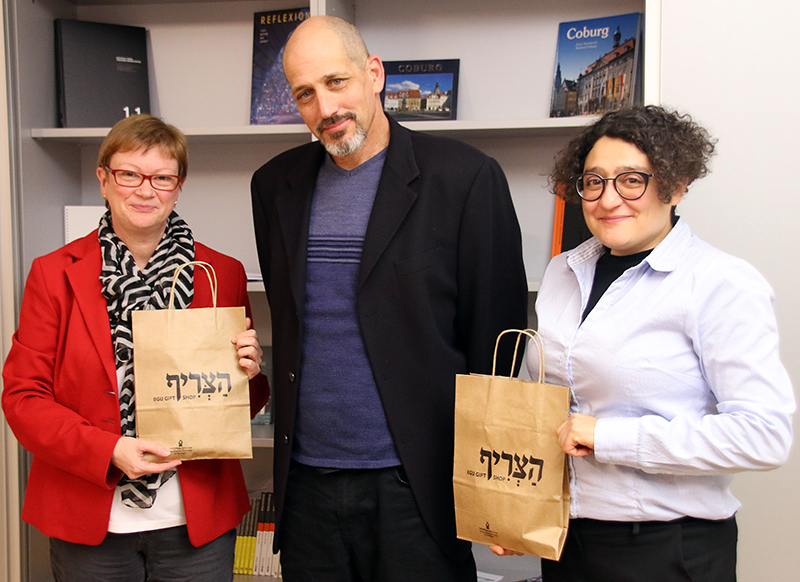 Dr. Yotam Lurie brought gifts from his university to President Christiane Fritze (left) and Milena Valeva. Dr. Yotam Lurie is lecturer at the Ben-Gurion-University based in the Israeli Negev desert. One of his areas of expertise are the ethical aspects concerning finance economy. He is working at the Faculty of Economics. He got invited from the University of Applied Sciences Coburg to take part in the recent international conference with the topic “Islamic Banking from the perspective of Ethics and Finance” held in Coburg. Taking a look at the conversation between university president Prof. Dr. Christiane Fritze and Dr. Yotam Lurie one can recognize very fast that there are a lot of similarities between both universities which can build a base for a good partnership. The Ben-Gurion-University owes its name the first Israeli Prime Minister David Ben-Gurion. His vision was to create a base for the scientific development of the Negev desert by the foundation of a university. Officially established in 1969, nearly 20 000 students study at three locations these days. While introducing his university Dr. Yotam Lurie emphasizes: “Our aims are applied research and the strengthening of the social involvement of our students.” President Christiane Fritze sees there a lot of similarities with Coburg. There are also overlaps in the fields of study and research. At the Ben-Gurion-University there are also an engineering faculty, a management school and an institute for biotechnology. Yotam Lurie got to know the University of Applied Sciences Coburg during a joint DFG-project with Dr. Milena Valeva. Valeva teaches in the Future Design in the master’s program. His visit to Coburg can be the beginning of a productive collaboration.